New York stands with Palestine’s Great Return March | Fight Back! 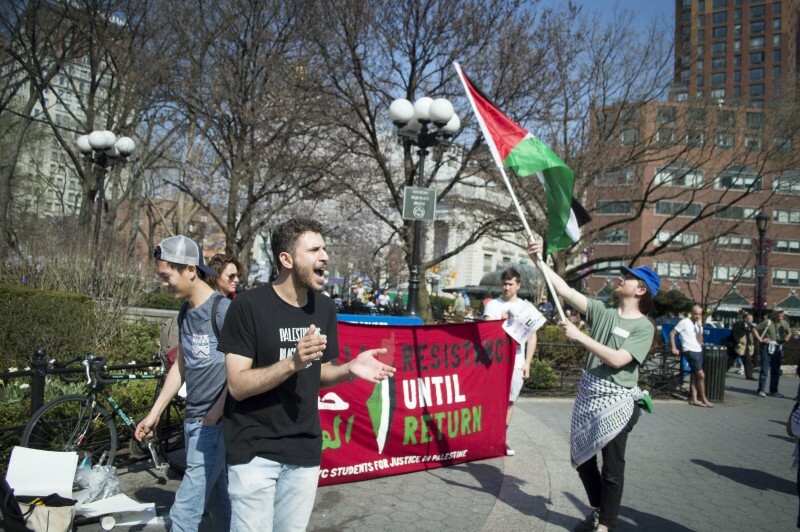 New York, NY – Around 50 people gathered in Union Square April 13 to stand in solidarity with the third week of Palestinians protesting on the border of Gaza. The protest in Gaza is called “The Great Return March” and it’s a six-week action leading up to the 70th anniversary of the Nakba. The Nakba is the 1948 Palestinian exodus, which literally means the “disaster” or “catastrophe”. More than 700,000 Palestinian Arabs were expelled out of their homes during the 1948 war for the Zionist occupation of Palestine. The people of Palestine have fought militantly for their land and freedom. The Great Return March is a testament to their powerful history. The rally, called by Within Our Lifetime and Palestinian Youth Movement, was spirited and active as people chanted and gave speeches. 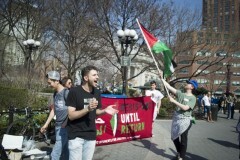 Protesters in New York will continue protesting and standing in solidarity with Palestine until May 18, where there will be a march to commemorate Nakba Day.